B-B is a classification that indicates there are two two-axle trucks, and all of the axles are powered. The 4GE733 indicates that there are four GE 733 traction motors. The 88/88 took a little research. But I found that the 45-tonner is a B-B-90/90 and the 80-tonner is a B-B 160/160. Then I found a 44-tonner operators manual (which happens to be for Phase III locomotives which started with s/n 18145) and could confirm that the weight of the locomotive was listed as 88,000 lbs. It would be interesting to see if operator manuals for earlier or later 44-tonners had a different class designation. 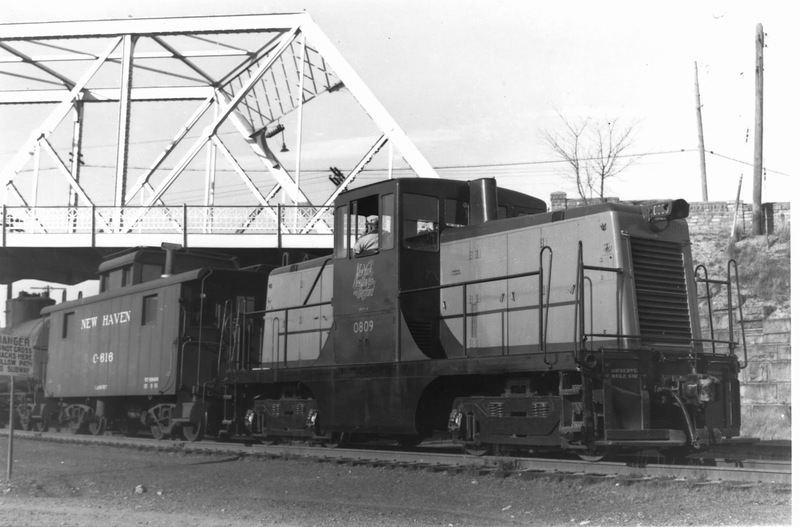 Aside from the Extra 2000 South article, there are some other resources for information on the operation and history of the DEY-4 locomotives on the New Haven. Here's the information I have from Engine Assignment Books, New Haven Condemnation records, and a New Haven Mechanical Department document from 1955. There are a some contradictions in these sources. 0814 - Seaview Ave. R. R.
0815 - Bridgeport Seaview Ave. R. R.
0816 - Bridgeport Seaview Ave. R. R.
0814 - Bridgeport Seaview Ave. R. R.
He also posted a great shot of #0813 on the Providence-Poscoag local which also partially answers a question I've had for a while: How many cars can a 44-tonner handle? At least 9, apparently. I'd also recommend Ed's sites, starting with New Haven Steam Locomotives and don't forget to scroll down on the home page to see a list of his other excellent railroad sites. Consult photos for other schemes worn by a given locomotive.